Before choosing a fire protection contractor, make sure you are making a good decision. From security systems to fire protection systems, companies spend hundreds, if not thousands, of dollars protecting their commercial spaces. But how do you find the most qualified contractor for the job? If not protected correctly, your commercial space could go up in flames in a matter of minutes. Let’s take a look at how you can find a qualified fire protection contractor for all of your business’s needs. Whether your potential fire protection contractor is a year old or 10 years old, every company worth hiring has a background to explore. Before hiring any contractor, it is important to explore this history as thoroughly as possible. Checking their background could reveal OSHA citations, EPA citations, or outstanding judgments or claims in the past five years. This information will help you decide if you want to risk working with that company. The next step is to find out about their reputation. 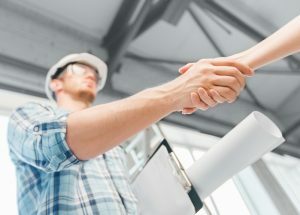 While a good fire protection contractor may stand out on paper, it is important to look into your potential contractor’s reputation and referrals. Ask the fire protection contractor for references and past companies they have worked with. But don’t just stick to the happy customers, ask about unhappy ones too. What were their complaints and problems? What did these people like about the contractor and what didn’t they do right? How were the problems handled? You should know that every job has obstacles but it is how they have been handled that matters. Installing a new fire protection system in your business is a large undertaking that can take months or even years to complete. This means you will be working closely with this business and its employees for the entire length of the project. It is important that you are familiar with the company and its employees and know who is doing what and how to handle any issues that may arise. What happens if something in your business goes missing or if you catch an employee doing something they aren’t supposed to be doing? You should know how to handle these situations and who to report them to. Before hiring a contractor, it may be beneficial to visit their business to see how they operate and how their management is. A company with a good manager will give you the best results. How many OSHA 10-hour certified workers are on your staff? How often does your company come in on or under budget? How many degreed engineers do you have on staff? How many NICET certified technicians to you have on staff and in what fields? How often do your employees have an on-the-job training or attend seminars in their field? Give me an example of when something didn’t go well during a job and how was the situation handled. Will my job have a dedicated job manager? These questions will give you insight on the company and help you choose the right one to be your fire protection contractor. For more information on choose one of the best fire protection contractors, call Fireline today! This entry was posted on Friday, August 5th, 2016 at 3:22 pm. Both comments and pings are currently closed.